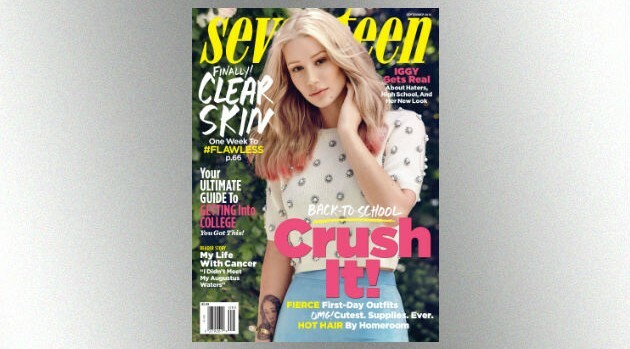 Max Abadian/SeventeenIggy Azalea wasn’t shy about admitting she got breast implants, and now she’s confirming to Seventeen magazine that she got a nose job, as well. “I’m not denying it. Denying it is lame,” she tells the mag in a September cover story. Most people noticed the Aussie rapper’s face looked a bit different at the Billboard Music Awards in May, but she hasn’t spoken publicly about the change until now. She doesn’t think there’s any reason to hide it, though. “I don’t think you should be ashamed if you made a change to yourself, which is why I’ve spoken about the changes I’ve made, like with my breasts,” she says. Iggy says she did a lot of online research before decided to get a nose job, and she admits it wasn’t an easy process.